Reprinted from the Summer/Fall 2002 Journal of the South Carolina Native Plant Society, and used by permission. Most visitors to the Upstate region will undoubtedly visit such vistas as Table Rock State Park or Caesars Head State Park for the beautiful views, outcroppings of rock and fall color. A less spectacular landscape, but very interesting flora is to be found at Peach Orchard Branch in Pickens County, South Carolina. Here, a combination of magnesium-rich bedrock, high rainfall and steep slopes combine to produce habitat for some very interesting and rare species of plant. Prime times for visiting this site are in April for spring flora and in late September and October for the fall flora. To reach Peach Orchard Branch, turn north onto Roy F. Jones Road from SC Hwy 11. This intersection is located east of the SC 133 intersection with SC 11 and west of the intersection of US 178. After turning north on Roy F. Jones Road, look for a pull-off with a red gate across a freshly graveled road. Park here along the road and cross over the gate and proceed across a recently cleared area and into a forested area. Immediately after crossing the gate you will notice an extensive group of goldenrods with extremely large, scabrous leaves and large yellow flowers produced on four to six foot tall stems. This is the now infamous “Eastatoee Goldenrod,” which is an undescribed type of Goldenrod found in the Eastatoee Creek area and also in western Virginia. This plant seems to be associated with high pH soils at both locations. It is so large and conspicuous that you might wonder how it could escape being noticed for so long. The answer comes from the requirements for flowering. 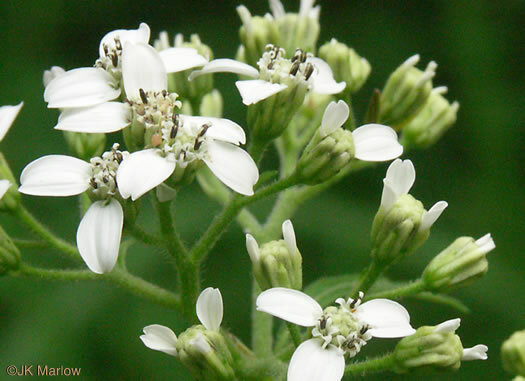 The plant requires full sunlight for flowering, but maintains itself as large colonies that produce only basal leaves in shady woodlands throughout this area. When a large enough light gap is created this plant bursts into flower. The recent construction opened up the area to sunlight and allowed the plant to bloom. Natural blow-downs in the forest also allow flowering but only sporadically. When not in flower the basal leaves remind you more of an aster such as Eurybia macrophylla than a goldenrod. Many other goldenrods are to be found along the path such as Carolina Goldenrod (Solidago arguta ssp. caroliniana), Rough Goldenrod (Solidago rugosa), Canada Goldenrod (Solidago canadensis) and Wand Goldenrod (Solidago caesia). 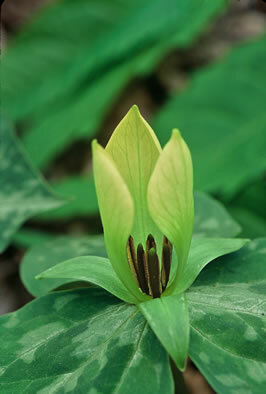 Other interesting plants are to be found in the regenerating forest and newly created openings along the path. The dense pink-flowered legume that lines the trail here is Bicolor Lespedeza (Lespedeza bicolor), which is planted as a game food but behaves as a rather nasty invasive exotic. Look for the Smooth Blue Aster (Symphyotrichum laeve) growing in this area. This plant produces large dark blue flower and has smooth leaves (hence the name). The plants here are of the variety laeve and are considered rare in South Carolina. 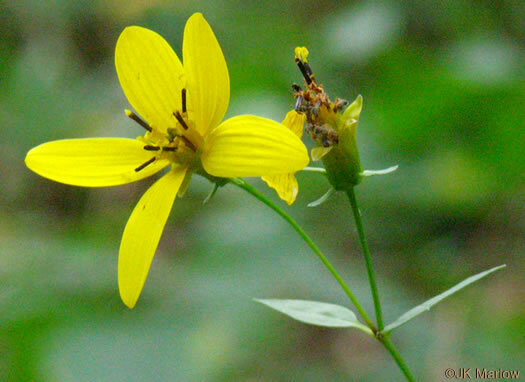 Two species of Rosinweed or Silphium may be seen along the path, Starry Rosin Weed (Silphium asteriscus) and Kidney-leaf Rosinweed (Silphium compositum). 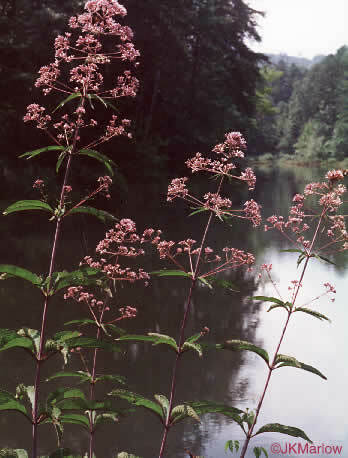 Here they mingle with the white-flowered Virginia Wingstem (Verbesina virginica) and Joe-pye Weed (Eupatorium fistulosum). A very peculiar, glossy-leaved small tree that is scattered along the trail is Carolina Buckthorn (Frangula caroliniana) which requires circumneutral soils for growth. At the edge of the forest everything changes and we encounter an entirely different suite of species. Shortly after entering the woods you will note that the trail forks, either fork is sufficient to see the vast majority of natives this trail has to offer. The woodlands here, like the successional communities, contain species which are dependent upon circumneutral soils and tend to be regionally rare. One of the uncommon species is the Broad-leaved Tickseed (Coreopsis latifolia) found in only a handful of sites in South Carolina. This is a very odd looking Coreopsis in that it doesn't resemble a Coreopsis at all! The broad, smooth leaves on an upright stem are more reminiscent of a wild sunflower. Growing in association is the Whorled Horsebalm (Collinsonia verticillata) that flowers in Spring, rather than in the summer, as do most Horsebalms. 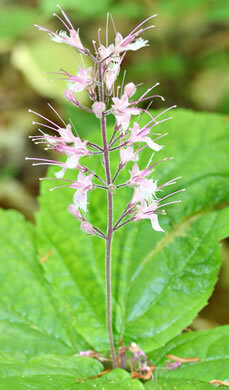 Three species of Collinsonia may be seen on the trail with Canada Horsebalm also known as Citronella (Collinsonia canadensis) the largest. The third species, Tuberous Horsebalm (Collinsonia tuberosa) is a much less spectacular and more diminuative species. Two very attractive sedges may be found along the trail, the Plantain-leaved Sedge (Carex plantaginea) and the South Carolina Sedge (Carex austrocaroliniana). 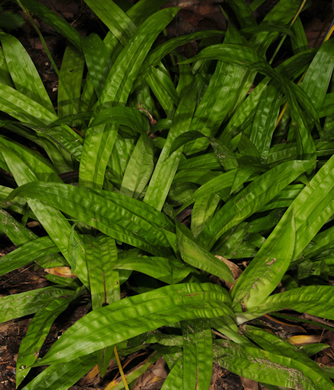 These species have red bases to the leaves but the leaves of the Plantain-leaved Sedge are the widest and showiest of any of our species. A much more uncommon species, Radford's Sedge (Carex radfordii) is evident here by the bright bluish-green leaves which can be as long as 24-30 inches. The leaf sheaths are striped with darker green in the spring, giving them the look of a pinstriped pair of trousers. This plant was only described a couple of years ago by Dr. L.L. Gaddy, an Upstate botanist. It is limited to the southern Blue Ridge escarpment region. The trail eventually parallels Peach Orchard Branch, near to the point where it empties into Eastatoee Creek. Along the creek banks you will notice a very familiar-looking plant, Alleghany Spurge (Pachysandra procumbens). You probably have not encountered this species but are familiar with its Asian counterpart Pachysandra terminalis which is often used as a ground-cover. The Alleghany Spurge is extremely rare in the Carolinas and this is part of a large population found along the Peach Orchard-Eastatoee drainage. Only one other location is known in South Carolina. The spotted leaves in whorls are extremely attractive; the small inconspicuous flowers are not! Growing with the Alleghany Spurge in the spring you will find Vasey's Wake Robin (Trillium vaseyi) with its immense red, white or pink flowers held under the leaves. Another treat is the large colonies of Faded Trillium (Trillium discolor) with pale yellow sessile flowers mixed with Foamflower (Tiarella cordifolia), Sharp-lobed Hepatica (Hepatica acutiloba) and in the fall, the inconspicuous Autumn Coral-root (Corallorhiza odontorhiza) may be seen. Many other fall species can be observed in the woodlands here including Blue Wood Aster (Symphyotrichum cordifolium), White Wood Aster (Eurybia divaricata) and various Snakeroots (Prenanthes spp.). Plan to spend an hour or two walking down this trail observing the plants and wildlife. You will find this to be a non-strenuous, rather level walk that will put on a good show of escarpment flora during any time of the year.